a d a p t i v e [ l.i.n.k ] | gURROO - A new generation of innovative minds. 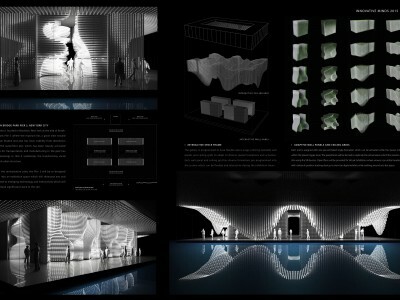 IDVA GALLERY is an adaptive space gallery designed to link the Virtual Space and Real Space. 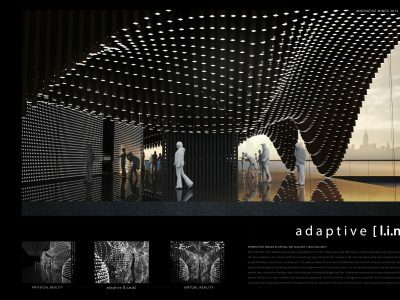 Utilizing operable ceiling grids and wall panels, the space adapts to the virtual conditions providing a space frame for the viewers in the physical space while they navigate through the space using VR headsets and motion tracking suits. 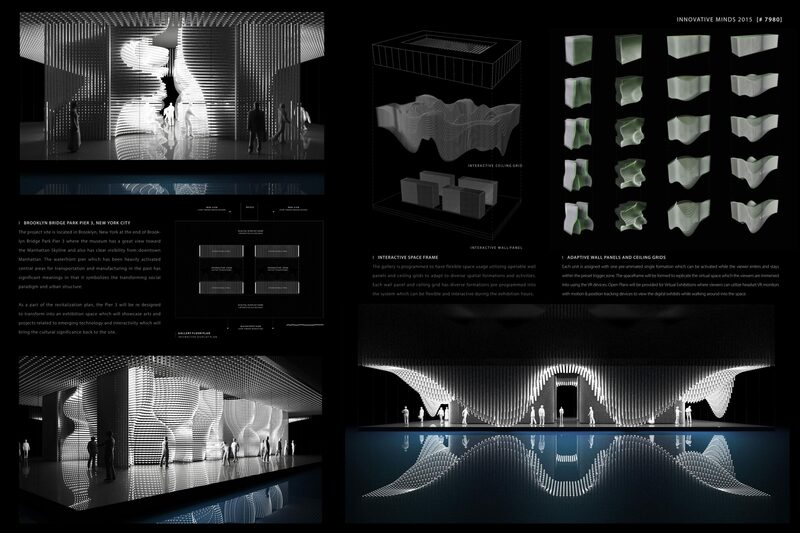 The gallery mainly hosts Virtual Art Exhibitions and Interactive Design Installations where each wall panel and ceiling grid has diverse formations pre programmed into the system which can be flexible and interactive during the exhibition. The project site is located in Brooklyn, New York at the end of Brooklyn Bridge Park Pier 3 where the museum has a great view toward the Manhattan Skyline and also has clear visibility from downtown Manhattan. The waterfront pier which has been heavily activated central areas for transportation and manufacturing in the past has significant meanings in that it symbolizes the transforming social paradigm and urban structure. As a part of the revitalization plan, the Pier 3 will be re designed to transform into an exhibition space which will showcase arts and projects related to emerging technology and interactivity which will bring the cultural significance back to the site. 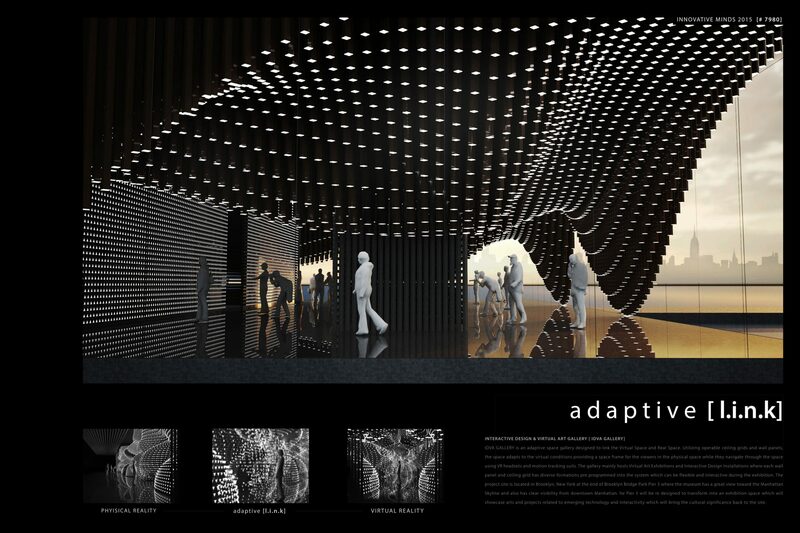 The gallery is programmed to have flexible space usage utilizing operable wall panels and ceiling grids to adapt to diverse spatial formations and activities. Each wall panel and ceiling grid has diverse formations pre programmed into the system which can be flexible and interactive during the exhibition hours. Open Plans will be provided for Virtual Exhibitions where viewers can utilize headset VR monitors with motion & position tracking devices to view the digital exhibits while walking around into the space. Each unit is assigned with one pre-animated single formation which can be activated while the viewer enters and stays within the preset trigger zone.